I spend a lot of time on Regulations.gov, the home of the public comment system. I bet you’re thinking there are plenty more entertaining places on the Internet where I can spend my time, so let me tell you why I’m there. First, Standing Partnership helps our clients successfully navigate the regulatory process using strategies such as stakeholder engagement, messaging and digital communications. Therefore, it is critical for us to be plugged in to where the action is. Second, the public comment system is one of the best places to observe and take inventory of the views and opinions of your stakeholders – whether they are strong advocates, vocal opponents or somewhere in the middle. Reading the comments on Regulations.gov can provide a perspective on the mindset and perceptions of the participating community – kind of like a protest. Long-term impact may not be immediately evident, but the “wow factor” is pretty apparent, especially scrolling through thousands of comments on a particular issue. And when you have good insight on your stakeholders’ perceptions, you’re likely to have a pretty good handle on your reputation. Regulatory agencies established the public comment period to allow for transparency and public involvement in their decision-making processes. It is rooted in the National Environmental Policy Act, which requires all federal agencies in the executive branch to prepare environmental assessments and environmental impact statements before establishing environmental policy. For example, comment periods allow the public to submit opinions on the petition for non-regulated status of biotech crops as well as the draft environmental assessment document written by the agency – in this case, the U.S. Department of Agriculture (USDA). The USDA uses public commentary (along with other information) in its decision to grant non-regulated status to a new product or technology. Products that receive significant public comments or an enormous number of comments could slow the regulatory agency’s decision-making process and could trigger a lengthy review process. 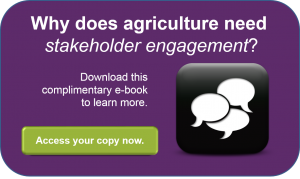 In short, stakeholders’ opinions shared via the public comment system could impact the commercialization of products and technologies, and ultimately a company’s business decisions and growth. It’s important to recognize that those stakeholder opinions could be influenced by a company’s reputation. Standing Partnership gets involved to help its clients monitor and understand public opinion, and then develop effective communication strategies for achieving their objectives – which is why you often find me hanging out at Regulations.gov. Make sure that you understand your stakeholders’ perceptions of your organization or product and then put that information to good use. Not sure where to start? Download our eBook to gather more insight on how stakeholders design, own and impact your reputation and what you should be doing to make sure you company is aligned with their expectations.